KIEV (Reuters) - Ukraine's parliament voted to remove President Viktor Yanukovich after three months of street protests, while his arch-rival Yulia Tymoshenko hailed opposition demonstrators as "heroes" in an emotional speech in Kiev after she was released from jail. Carried on to a stage in a wheelchair, an emotional and tired-looking Tymoshenko told the protesters on the square, known as the Maidan: "You have no right to leave the Maidan ... Don't stop yet. В Государственной пограничной службе Украины заявляют, что не позволили чартерному рейсу с Виктором Януковичем на борту вылететь из Донецкого аэропорта. Об этом УНН сообщил помощник главы Госпогранслужбы Сергей Астахов. "Сегодня в аэропорту Донецка пытался вылететь чартерный рейс без соответствующего пограничного оформления. Не было заявки для вылета этого чартерного рейса", - Сергей Астахов. Во время проверки к пограничникам вышли из самолета вооруженные люди, которые предложили деньги взамен на срочное оформление самолета. 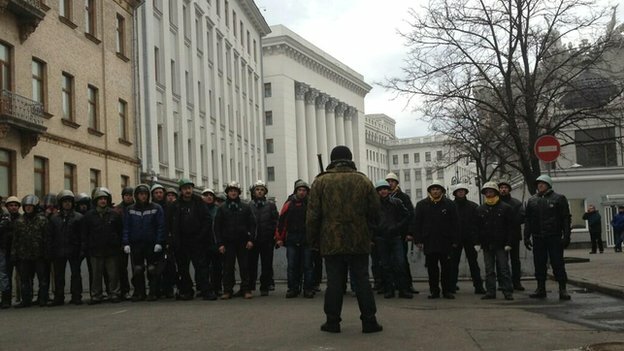 Однако пограничники отказались. "После этого приехали два бронированных автомобиля. С самолета вышло Первое должностное лицо страны, село в автомобиль и покинуло территорию аэропорта", - сообщил чиновник. Напомним, ранее представитель Госпогранслужбы Сергей Астахов сообщил, что генпрокурор Виктор Пшонка и исполняющий обязанности главы Министерства доходов и сборов Александр Клименкопытались покинуть Украину, однако их не пропустила Госпогранслужба. Лидер партии "Батьківщина" Юлия Тимошенко намерена приступить к работе и считает, что украинцы вскоре увидят "других политиков". Об этом она заявила, перед тем как покинуть сцену на Майдане, передает УНН. "Сейчас я возвращаюсь к работе", - заявила Тимошенко в конце выступления. Напомним, выступая со сцены Майдана, она обратилась с просьбой к митингующим не покидать Майдан, пока не найдут и не накажут виновных в смерти людей. По ее словам, когда она заехала в Киев, то первое, что увидела были сожженые машины, цветы и "другая Украина", которую добыли в борьбе герои Майдана". Аншлаг на аэровокзалах. Столичные аэропорты за минувшие сутки отправили гораздо больше бизнесс-рейсов чем обычно. В аэропорту "Киев" говорят - побили все рекорды и за одну ночь отправили в 80 чартерных рейсов. Еще ночью аэропорт "Киев" встречал гостей блокпостом. Это не сотрудники аэровокзала, а активисты самообороны. WASHINGTON: U.S. President Barack Obama and Russian President Vladimir Putin agreed on Friday that a deal aimed at halting bloody clashes between government forces and protesters in Ukraine needs to be implemented quickly to stabilize the country, a U.S. official said. The two leaders spoke by phone after Ukrainian President Viktor Yanukovich and opposition leaders signed a European Union-mediated peace deal. "They agreed that the agreement reached today needed to be implemented quickly, that it was very important to encourage all sides to refrain from violence, that there was a real opportunity here for a peaceful outcome," a senior U.S. State Department official told reporters on a conference call. The White House said details of the agreement are consistent with what the United States had been urging, such as a de-escalation of the violence, constitutional change, a coalition government and early elections. The State Department official warned, however, that the deal remains "very, very fragile," and said international support will be needed to help stabilize the country. "This has been a very tough sell and will continue to be a tough sell for the opposition to make to those on the streets. This is not least because of the horrible, horrible violence of the last two days," the official said. Putin also emphasized the fragility of the situation and suggested "radical" opponents of the government were a potential threat to the deal. Putin "underscored the need to take urgent measures to stabilize the atmosphere, accenting the importance of work with the radical opposition, which brought the confrontation in Ukraine to an extremely dangerous point," the Kremlin said in a brief statement. Russia has said the West shares blame for the bloodshed because it encouraged violent opposition groups by failing to condemn their actions. 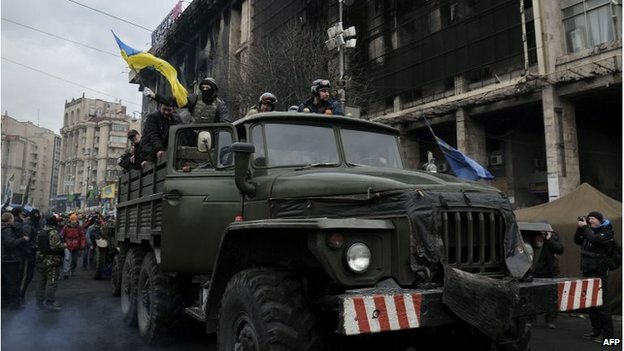 Tony Blinken, deputy U.S. national security adviser, said in a CNN interview that the Obama administration had made clear to Ukraine there would be consequences if the violence continued. "And I think that had an important impact in getting people to move," Blinken said. "We've already issued some visa restrictions on those who were responsible for the violence and repression. U.S. Deputy Secretary of State William Burns will go to Kiev early next week and Assistant Secretary of State for Europe Victoria Nuland will likely visit in early March to be part of international support for the implementation process. Senior U.S. officials had been preparing new sanctions to impose on Ukraine's government after dozens of people were killed in Kiev during mass demonstrations this week. The White House reiterated that those responsible for the violence must be held accountable. "We are not ruling out sanctions to hold those responsible for the violence accountable, especially should there be further violence or violation of the agreement," said White House spokesman Jay Carney. Carney said efforts of the French, Polish and German foreign ministers as well as U.S. leaders helped bring about the deal. He added that "Russia witnessed the agreement and ... played an important role in that respect." "It is in Russia's interest that Ukraine not be engulfed in violence - Kiev or other places - and that it return to stability, and that progress be made toward a future in Ukraine that reflects the will of the Ukrainian people," Carney told a news briefing. "So it's very important to view this not as a tug-of-war between East and West or the United States and Russia," he added. WASHINGTON — After putting the tense Russian-American relationship on “pause” last year,President Obama and his team have lately been working to get it back on track by quietly planning a possible meeting this summer with President Vladimir V. Putin. The two sides have even begun discussing a trade agreement for the two to sign. But the bloody political crisis in Ukraine has underscored just how hard it will be to restore constructive ties between Washington and Moscow. While the two sides were facing off this week over the future of the strategically located former Soviet republic, the prospect of renewed summitry appeared problematic. Now with a fragile deal in Kiev, American officials said, a meeting may yet come together. Mr. Obama, who last summer became the first president in more than a half-century to cancel a meeting with his Russian or Soviet counterpart, called Mr. Putin on Friday, and they talked for an hour about Ukraine and other points of division like Syria and Iran. American officials characterized the call as surprisingly productive and took it as a sign that despite recent friction, there might be a path forward. The future of United States-Russia ties, however, has rarely been more uncertain or volatile. Ukraine is just the latest in a series of issues that have strained relations, including asylum for the former National Security Agency contractor Edward J. Snowden, the civil war in Syria, differences over arms control, and Russia’s domestic crackdown on dissent. With the end of the Winter Olympics in Sochi and the worldwide spotlight that comes with it, some in Washington worry that Mr. Putin will feel free to further tighten the vise on critics at home. And if the Ukrainian deal falls apart again, as many fear it might, Mr. Obama and Mr. Putin could once again find themselves squaring off. “The challenge we face is that even as Americans and Europeans believe we aren’t engaged in a zero-sum game with Russia, Russia unfortunately is playing a zero-sum game with us,” said Damon Wilson, a former national security aide to President George W. Bush and now executive vice president of the Atlantic Council. Mr. Obama insisted this week that he does not see his differences with Mr. Putin “as some Cold War chessboard in which we’re in competition.” But the American government was deeply involved in the Ukrainian crisis in a way that convinced Mr. Putin of the opposite. Vice President Joseph R. Biden Jr. talked with President Viktor F. Yanukovych nine times in the past several months, including an hourlong telephone call on Thursday as the government and opposition were negotiating their deal. American officials insisted their interest was in seeing the Ukrainian people make their own choices. But the Kremlin’s accusations of meddling hang over the White House even as it tries to pick a successor to Ambassador Michael A. McFaul, who is leaving his Moscow post. One name that has been floated inside the West Wing is John F. Tefft, a recently retired career diplomat. But because he has served as ambassador in Lithuania, Georgia and Ukraine, three former Soviet republics that have resisted Moscow’s regional dominance, Mr. Tefft is viewed warily by the Kremlin, and Mr. Obama will have to decide whether his selection would be constructive or provocative. The White House has been exploring that very question for the past two months. Russia will host the annual Group of 8 summit meeting in June in Sochi, the scene of what Mr. Putin sees as his Olympic triumph. Since Mr. Obama feels obliged to attend, he and aides began considering whether to have a separate one-on-one meeting with Mr. Putin, as is traditional at such events, restoring ties after canceling last September’s visit to Moscow. Aides said Mr. Obama is not interested in a meeting that simply rehashes disagreements, so the two sides in December began talking about whether there were areas where they could make substantive progress. Arms control seemed to be out: Moscow has expressed no interest in Mr. Obama’s latest proposals to cut their mutual nuclear arsenals, and recent reports of Russian violations of a Cold War-era treaty have made it harder, if not impossible, to get Senate approval for a new pact. Likewise, the two sides no longer have as much to talk about in terms of Afghanistan, one area of agreement in the past, because Mr. Obama plans to withdraw most or all American forces from there by the end of the year, making the supply route Russia has provided moot. And so the Americans and Russians have been discussing one issue of mutual interest: economics. Even as Mr. Obama negotiates sweeping new trade treaties with Europe and Asia, aides have been talking about a separate trade treaty with Russia. Celeste A. Wallander, the president’s Russia adviser, floated ideas in Moscow in December, and Igor Shuvalov, a Russian deputy prime minister, visited Washington the same month for talks with Michael Froman, the president’s trade representative. More discussions took place on the sidelines of the World Economic Forum in January, and Aleksei Ulyukayev, Russia’s minister of economic development, will travel to Washington next week and meet on Wednesday with Penny Pritzker, the commerce secretary. “We’re coming to the point where we might have a set of priorities,” one of the administration officials said. Even though trade has reportedly increased since Russia joined the World Trade Organization and the United States lifted Cold War-era trade restrictions, commerce between the two countries remains a fraction of what either does with China or Europe. But any trade agreement that requires congressional approval could be a hard sell without progress on human rights in Russia. That makes some specialists wonder whether the trade talk is mainly a way of simply getting the two leaders together. “To what extent are the two governments moving this thing because there’s a real substantive need or desire for it and to what extent are they doing it because they can’t think of anything else to talk about?” asked E. Wayne Merry, a former diplomat who served in Moscow and is now a senior fellow at the American Foreign Policy Council. Press Reports: Yanukovich resigned, Timoshenko is free! Только что появилась информация о том, что экс-премьер-министр Юлия Тимошенко якобы вышла из колонии. На брифинге в Верховной Раде Украины народный депутат Николай Катеринчук прокомментировал информацию об отставке Президента Виктора Януковича. Советник президента назвала данную информацию "спекуляциями"
Ukrainian protesters have been able to enter the president's official and residential buildings in Kiev, after they were abandoned by police. They have not gone into the offices themselves - stationing their own guards outside entrances. Police say they support the people. 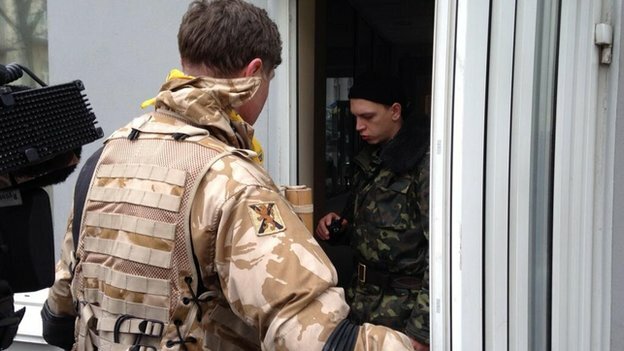 President Viktor Yanukovych's aides say he is in Kharkhiv, close to Russia. They have called for elections before 25 May, not the end of December as envisaged in Friday's peace deal. Kevin Bishop‏@bishopkbishop: "We do not know where president is" opposition spokesman at presidency. Kevin Bishop ‏@bishopk: Self defence "We are holding outside of building. There are no workers of presidency inside"
Duncan Crawford@_DuncanC: Lines of protesters - all in hard helmets, some of them armed with sticks - now guard the road outside the president's office. This is where President Yanukovych and his staff normally work. All the doors are locked. There are a few security guards. Relaxed, smiling but not jubilant, protesters here say they want to restore order and avoid provocation, to bring life back to normal. 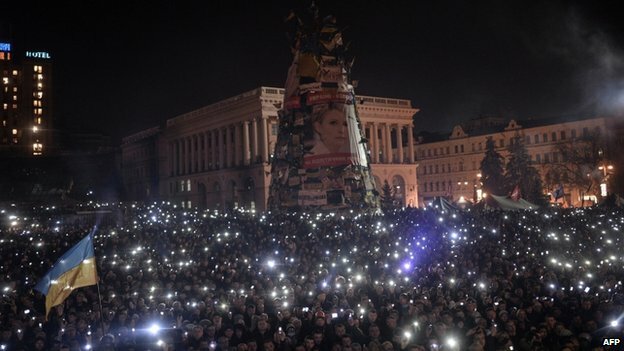 Despite the EU-mediated agreement, thousands of people have remained on the streets of Kiev. As parliament met on Saturday morning, its speaker Volodymyr Rybak resigned, citing ill health. 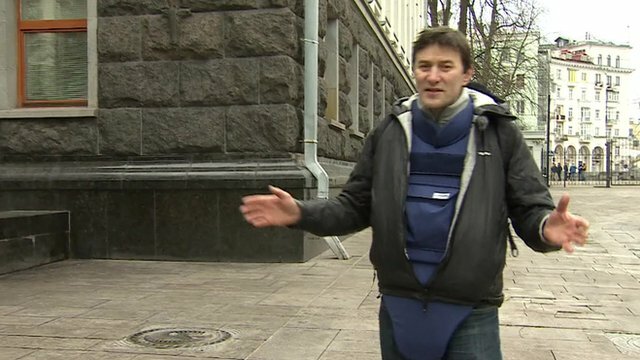 He has been replaced by Oleksandr Turchynov, an ally of jailed opposition leader Yulia Tymoshenko. Vitaly Klitschko, leader of the opposition Udar party, told MPs: "We must, as the people demand, adopt a resolution calling on Yanukovych to immediately resign." Presidential aide Hanna Herman said Mr Yanukovych had travelled to Kharkiv in the east, close to the Russian border, from where he was to give a televised address. A gathering of deputies from the south-east and Crimea - traditionally Russian-leaning areas - is taking place there, but Ms Herman said the president had "no intention" of attending. "As much as some people want it, he has no intention to leave the country," she said. The protests first erupted in late November when Mr Yanukovych rejected a landmark association and trade deal with the EU in favour of closer ties with Russia. 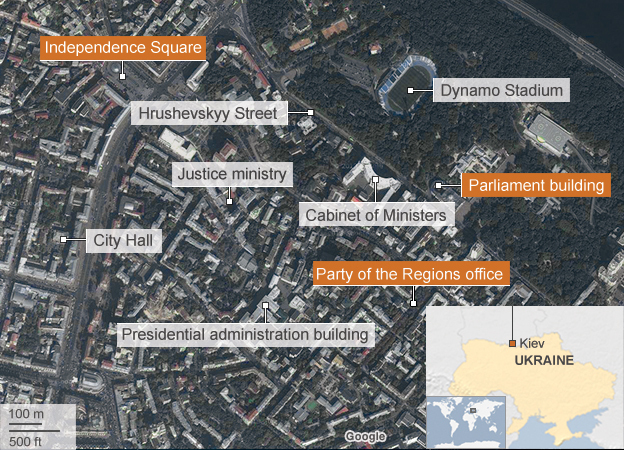 On Thursday, police opened fire on protesters who have been occupying Independence Square in central Kiev. The health ministry said 77 people - both protesters and police - have been killed since Tuesday. 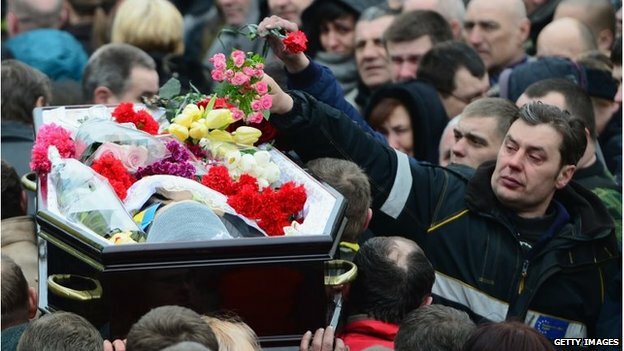 For a second day, funerals are being held in the square. Our correspondent says there is no sign of security forces inside the previously heavily guarded presidential complex and that journalists and protesters were able to enter freely. "He's not here, none of his officials or anyone linked directly to the administration are here," said Ostap Kryvdyk, a protest leader, referring to the president. The protesters said they were protecting the buildings from looting and vandalism. Correspondents say police appear to have abandoned posts across the city, while the numbers gathered in Independence Square - known as the Maidan - are growing. In a statement, the interior ministry said the police force was "at the service of the people and completely shares its aspirations for rapid changes". "We pay homage to the dead," it added. The political pact was signed on Friday by President Yanukovych and opposition leaders after mediation by EU foreign ministers. It says a unity government will be formed and elections held by the end of the year, but the opposition say this is not soon enough. Russia's Vladimir Putin told Barack Obama in a telephone conversation on Friday that Russia wants to be part of the implementation process, a US State Department spokesperson said. Shortly after the deal was signed, Ukraine's parliament approved the restoration of the 2004 constitution, which reduces the powers of the president. All but one of the 387 MPs present voting in favour, including dozens of MPs from Mr Yanukovych's own Party of Regions. Parliament also approved an amnesty for protesters accused of involvement in violence, and for a change in the law which could lead to the release for Mrs Tymoshenko. Send your pictures and videos to <a href="mailto:yourpics@bbc.co.uk">yourpics@bbc.co.uk</a> or text them to 61124 (UK) or +44 7624 800 100 (International). If you have a large file you can upload here.